This event is held once every two months. 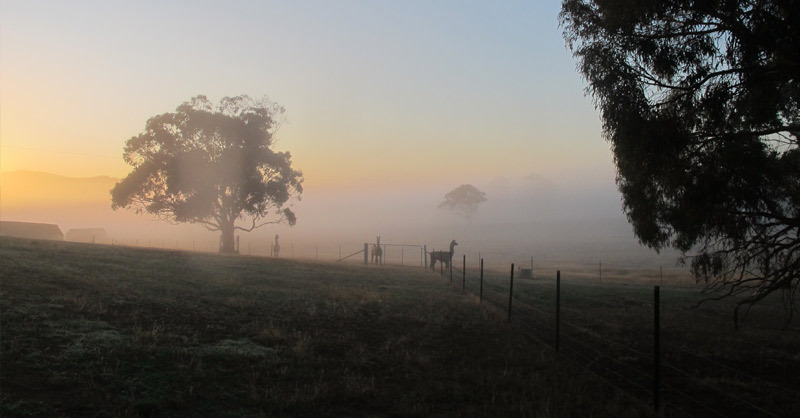 On a misty morning watch the mist rise revealing a tranquil vista of paddocks and rolling hills, with dozens of alpacas and llamas peacefully grazing… or on a frosty morning watch the frost on their whiskers and fleece become steam rising from their bodies as they amble up the paddock for their breakfast. This is a rare opportunity and one not to be missed – meet over 100 alpacas and llamas, learn about them, and take wonderful “selfies” with them. Feed them treats (bring carrots finely sliced – not more than the width of a coin). Bring your own picnic breakfast and mingle with these gentle and inquisitive animals. You could well lose your heart to an alpaca or llama. Wear warm and comfortable clothing and sturdy shoes, bring your camera. Well supervised children are welcome.